The Queens Royal Lancers were formed in 1993, with the amalgamtion of the 16th/5th and the 17th/21st Lancers. They are currently based in Catterick, North Yorkshire, UK. The QRL are basically an armoured cavalry regiment equipped with Scimitar, Saltan, Samson, Samaritan, Spartan and Striker CVR (T)s plus Landrover and Truck support. 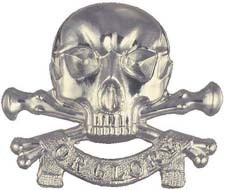 The regiment motto is "Death or Glory" represented by a skull and crossed thighbones. The motto is worn with a red backing on the cap. A great big thank you to all at the Queens Royal Lancers for putting up with me during their stay on the SPTA.